West Jordan man miscalculates length of rope, hits ground. Brian Maffly | The Salt Lake Tribune Corona Arch near Moab has become what is billed as the world's largest rope swing after climbers figured out how to adapt climbing gear to set up a thrilling 250-foot pendulum ride under the arch. Concerned with liability issues, state officials recently shut down the arch, which is on state-owned land, for commercially guided swinging, pictured here on Nov. 4. 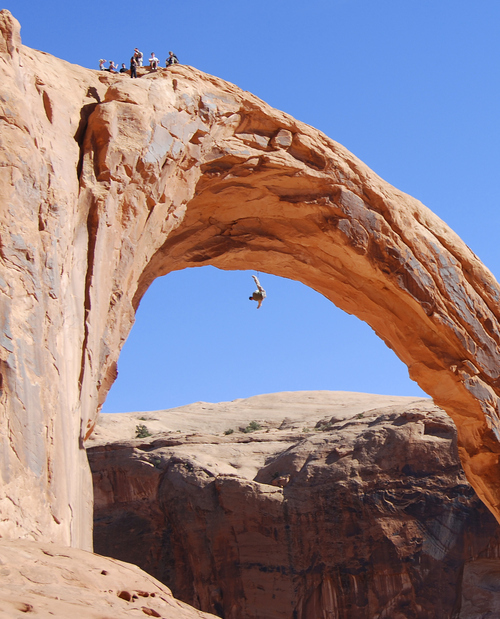 A Utah man died in a swinging accident from the arch this weekend during a private outing. Brian Maffly | The Salt Lake Tribune Corona Arch near Moab has become what is billed as the world's largest rope swing after climbers figured out how to adapt climbing gear to set up a thrilling 250-foot pendulum ride under the arch. Concerned with liability issues, state officials recently shut down the arch, which is on state-owned land, for commercially guided swinging, pictured here on Nov. 4. 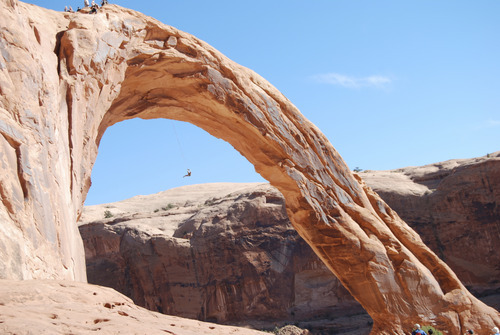 A Utah man died in a swinging accident from the arch this weekend during a private outing. Brian Maffly | The Salt Lake Tribune Corona Arch near Moab has become what is billed as the world's largest rope swing after climbers figured out how to adapt climbing gear to set up a thrilling 250-foot pendulum ride under the arch. Concerned with liability issues, state officials recently shut down the arch, which is on state-owned land, for commercially guided swinging, pictured here on Nov. 4. 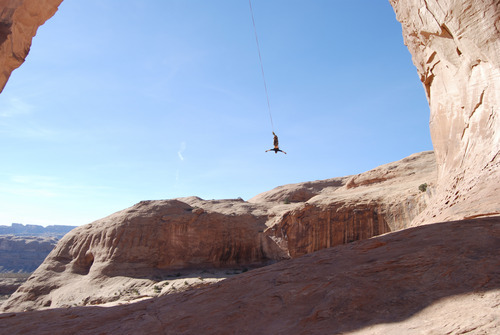 A Utah man died in a swinging accident from the arch this weekend during a private outing. Brian Maffly | The Salt Lake Tribune Corona Arch near Moab has become what is billed as the world's largest rope swing after climbers figured out how to adapt climbing gear to set up a thrilling 250-foot pendulum ride under the arch. Concerned with liability issues, state officials recently shut down the arch, which is on state-owned land, for commercially guided swinging, pictured here on Nov. 4. A Utah man died in a swinging accident from the arch this weekend during a private outing. A weekend rope-swinging outing at southeastern Utah&apos;s popular  and infamous  Corona Arch ended in the death of a West Jordan man. The Grand County Sheriff&apos;s Office confirmed Monday that 22-year-old Kyle Stocking died about 3:30 p.m. Sunday while attempting to swing from atop the 140-foot high, red sandstone arch, an extreme sport activity made popular of late by YouTube videos. Sheriff&apos;s Lt. Kim Neal reported that the "length of rope to swing from the arch was miscalculated and when [Stocking] swung under the arch, he struck the ground . . . receiving fatal injuries." County deputies, search and rescue personnel and paramedics were called to the scene from nearby Moab, but Stocking was dead at the accident scene. He was with five friends at the time of his death. The arch and its associated trail system are located on a mix of land managed by the Bureau of Land Management (BLM) and the School and Institutional Trust Lands Administration (SITLA). In January, SITLA informed a commercial outfitter that it could no longer take paying clients to the arch. But it has remained open to private parties for climbing, rappelling and swinging. Corona Arch is among 46,000 acres of recreational land in San Juan, Grand and Uintah counties that SITLA plans to exchange for BLM land with mineral potential. SITLA did not want to hand the BLM a parcel encumbered with that use, officials said earlier this year. On Monday, Kim Christy, deputy director of SITLA, said the land exchange is on track to take place by this fall and there is no plan to rescind the restriction on commercial guides. The agency has placed signs near the arch, warning visitors that swinging from the arch is risky. "As far as the general public is concerned, there is no way we can keep people out of these areas," Christy said about recreating on public lands. "There&apos;s no way on Earth you can tell someone not to climb a mountain." But Thad James, who owns the Sandy-based Utah High Adventure, said allowing commercial outfitters to control the activity would be safer. His company regularly escorted people to the arch to swing before SITLA restricted the activity. "It&apos;s awful that this actually happened," James said Monday of Stocking&apos;s death. "I thought it was going to happen." James said he gets calls "every day" from people asking whether he is still guiding groups to the arch. When he says no, they ask for advice. "I think that would be a lot safer if it could be commercially used," he said. In a statement issued Monday, the BLM expressed sympathy for Stocking&apos;s death and said it would evaluate how best to manage such activities. 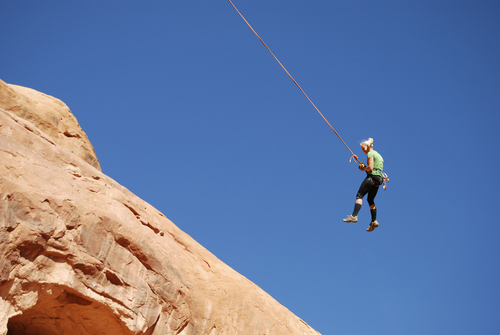 "The BLM Canyon Country District Office has been reviewing activities like rope swinging and high-lining, as well as the conflicts that can arise between high energy, high adrenaline pursuits and the more quiet experiences often sought by other public land users at scenic attractions like Corona Arch," said Megan Crandall, BLM spokesperson. "Looking ahead, the Moab Field Office will be taking a closer look at appropriate ways to balance and manage these activities on public lands." Last year, Corona Arch became known as the site of "the granddaddy of all cheap thrills" after climbers adapted their gear to set up a rope with a 250-foot pendulum swing through the geological feature. Anne Wilson contributed to this story. Twitter: @remims "It is the most tragic experience to receive the phone call from the sheriff letting you know that your son has been killed in a terrible accident that could have been avoided. We hope and pray that there will be no more parents experiencing what we are going through. There is a huge in hole in our hearts."